As we enter 2018, some arrive armed with new resolutions, some endeavor to revivify old ones, and some deftly side-step the whole process. For those of us that love reading, a resolution about books invariably ends up on the list somewhere, whether it encompasses reading more books, reading new types of books, or actually writing a book of our own! 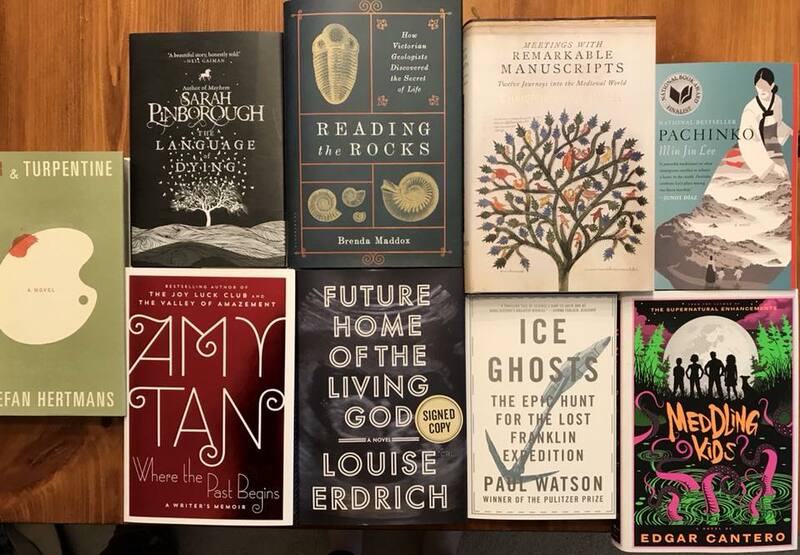 In the interest of inspiring each of you to explore new opportunities, our reading list this month offers more books than usual, as well as some diverse selections, ranging from dystopian fiction to Victorian geology and everything in between! And I would have gotten away with it too, if it weren’t for you meddling kids! Fans of Scooby Doo will immediately recognize those words, uttered in disdain by nearly every unmasked villain at the end of every episode. But the villains – at least for the Scooby gang – are always real people masquerading as supernatural forces; the characters in Meddling Kids should be so lucky. Edgar Cantero’s novel features a Scooby-esque band of young detectives – all grown up and battling through their own dysfunctional lives (and afterlives) – until the time arises when they have to get the band back together to face their own demons, once again. For those unfamiliar with the Franklin Expedition – I was one of those until hearing about the topic on the podcast Stuff You Missed in History Class – the expedition, led by Captain John Franklin, set out in 1845 to find the fabled northwest passage. By the “end” of the arduous journey, all 129 of the crew members of the HMS Erebus and HMS Terror would be lost. Paul Watson’s book, Ice Ghosts, brings the reader up to the modern day, after the discovery of the Erebus in 2014 and the Terror in 2016. He also draws upon Inuit sources to reconstruct the (oral) narrative about what actually happened to the Franklin crew members back in the 19th century. “Maybe God has decided that we are an idea not worth thinking anymore,” Future Home of the Living God’s narrator expresses. In this dystopian – but hauntingly conceivable – novel, Louise Erdrich paints a vivid picture of a world in which the internet is unreliable, the government takes over cable companies, the banks run out of money, and all pregnant women are ordered to turn themselves into the government in order to give birth in controlled conditions. At the heart of the novel beats Cedar Hawk Songmaker, a woman struggling with her identity and genetic history, while navigating a world that is increasingly dangerous for humanity, let alone a woman that is four-months pregnant. Amy Tan, author of The Joy Luck Club and The Valley of Amazement, offers up an incredibly sensitive and self-reflective memoir, delving into childhood trauma, family, her emotionally troubled mother, and the inevitability of her becoming a writer. Pieced together in chapters, ‘interludes’, and ‘quirks’, Where the Past Begins provides insight into the life of a professional writer, as well as the memories that provided fodder for some of her most striking works. War & Turpentine is a remarkable blending of fact and fiction, of history and creativity. Upon his grandfather’s death, a young writer is given two notebooks that contain the story of his grandfather’s life as a soldier and artist. Armed with those written words, the young writer sets out to tell his grandfather’s story, creating narrative from his memories, revisiting the places found in the notebooks, and endeavoring to find a sense of meaning – for himself and his grandfather. Originally written in Dutch, David McKay does a masterful job of rendering such a thematically complex novel into English. The Language of Dying encapsulates the tensions present in a family as they prepare for the impending death of one of their own, as well as the uncomfortably mundane nature of waiting. At its core, The Language of Dying is a novella about family and loss, with flashbacks that explore the family’s history and serve to create a sense of universality as it pertains to the experience of death. Not only is Meetings with Remarkable Manuscripts a triumph of manuscript collection and illumination (pun intended), De Hamel’s book is filled with photographs, illustrations, drawings, and anything else that might prove useful in the successful ‘reading’ of manuscripts. The inclusion of such brilliant pictures, interspersed with thoughtful and thought-provoking text, is a testament to the impact that a well-organized book can have. Ranging from the Book of Kells to the oldest manuscript of the Canterbury Tales, Meetings explores the culture, art, and innovation over the course of a millennium. Following four generations of a Korean immigrant family living in Japan, Pachinko wrestles with issues of identity, belonging, and place, and does it so deftly that shifts from story to story, character to character, and mindset to mindset become cumulative, making the novel more substantial and profound than any one story. Pachinko is powerful, rolling real and imagined history into one captivating story that has to be experienced as much as read. © 2019 Crystal Clear Resources.